Of the eleven million foreign visitors arriving annually at Suvarnabhumi International Airport in Bangkok, almost five million do a ‘right turn’ and head on to Phuket. There’s something going on down there! Phuket is thriving and it’s not difficult to see why. Twenty four pristine beaches, six golf courses, a James Bond film set and reefs yet to be explored. When Suvarnabhumi struggled to handle the traffic initially, many domestic flights were moved back across to the rapidly decommissioned Don Muang and some confusion ensued. Whilst never approaching the Heathrow terminal five levels of chaos, the switch to a different airport still caught out many travelers and continues to do so. For instance, Thai Airways International operates flights to Phuket from both Suvarnabhumi and Don Muang, a three digit suffix denotes a Suvarnabhumi and four digits a Don Muang departure. Confused? You are not alone. It does pay to be aware of this. 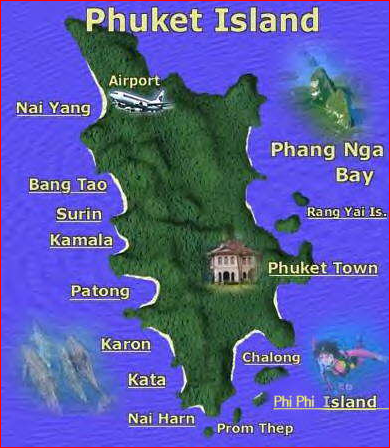 Once on the ground at Phuket, it will take the most frustrating 40 minutes of your journey to transfer to any of the major beach resorts; Patong, Kata, Karon or Rawai. For nightlife, Patong is the obvious destination. Soi Bangla and the surrounding area has enough bars and clubs to keep even the liveliest of party people busy. Karon, Kata and Rawai are a little more sedate, but Patong is only a tuk-tuk ride away for those who find themselves in need of a clubbing fix. Phuket City also has a thriving nightlife scene but fails in comparison to Patong as it's less flashy. The other locations on Phuket island are very much more family orientated with great resorts, romantic getaways, less crowded bars and great for those that want a more peaceful type of holiday in Thailand. So choices for all.